This year's SummerSlam wasn't just one of the best pay-per-views of the year, not just one of the greatest SummerSlam's of all time, but one of the best pay-per-views WWE has ever put on. 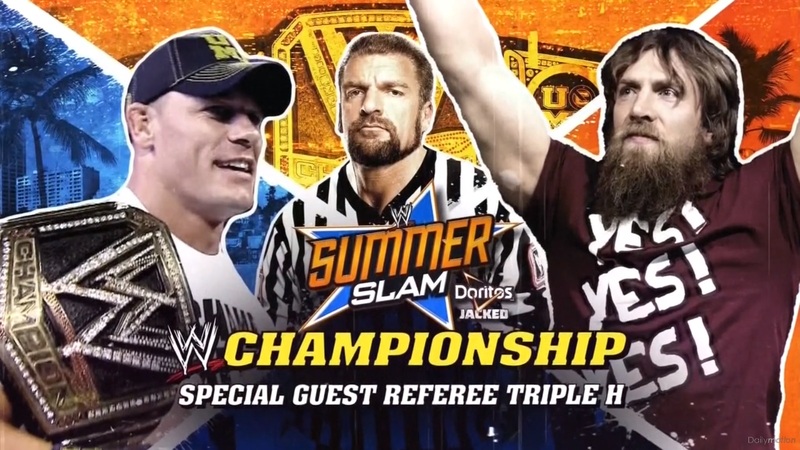 Headlined by two strong main events, and featuring a beautifully done swerve at the conclusion of the show, this year's SummerSlam is a must-watch. Now, the build up to this one had been over complicated and at times frustrating to follow. Despite strong work from both Daniel Bryan and John Cena, WWE had decided to throw a number of other character's into the mix, including The McMahon Family, Randy Orton, Ryback, The Shield and Wade Barrett, who really weren't needed to tell the story of Indy darling vs. Company man. Bryan and Cena had some excellent exchanges discussing this, including a strong edition of Miz TV on the final Raw before the show. Going into the match, I was hoping that Bryan and Cena would be left alone for the most part to tell the story that I knew they were capable of. Luckily that is what we got, with very little involvement during the match from Special Guest Referee WWE COO Triple H. The match told a great story with the men going back and forth for a lot of the match up, with a number of interesting reversals. John Cena certainly felt like he was playing the heel in this bout, as he kept Bryan under his control on numerous occassions, as the pair built up for Bryan's signature comeback. The wrestling in the bout was, mainly, strong, helping to lay the foundations for the story to be told on top, with a strong section seeing Bryan flip out of an Attitude Adjustment attempt from Cena, and eventually lock on a version of Cena's STF submission finisher, with Cena selling well. I've been criticical of Cena's version of the STF before, but in this bout he actually locked it in, even rolling onto his back to add extra pressure. The moment that turned Daniel Bryan into a fully blown mega star in this contest saw Bryan superplex Cena, but hook his legs over the top rope, remaining in position, the crowd absolutely loved it and you knew you were watching something special. The only thing that detracted from the match for me, was when Bryan attempted a hurricanrana from the top rope, only for Cena to hold on and look like he was about to hit a Styles Clash, only to jump down from the top rope, in what looked dangerously close to spiking Bryan's neck on the canvas. The ending of the match, saw Bryan building momentum, only for Cena to get him up ready for an Attitude Adjustment, mouthing the words “It's Over”, Bryan however managed to reverse into a small package for a two count. After a signature kick to Cena's head, Bryan waiting for Cena to get to his feet, before delivering a version of the Knee Trembler in a nice homage to William Regal to pick up the pinfall victory and win his first ever WWE Championship. I thought this ending was superb, as it showed Cena's vulnerability and ego thinking he had the match won, before Bryan put up one last fight to win clean over the face of the WWE. It really was fantastic moment, with real emotion pouring out of Bryan and the crowd absolutely loved it with streamers and confetti falling from the ceiling. It was the perfect end to the perfect story of Daniel Bryan's long chase for the WWE Championship and I could think of anyone who deserves to hold that belt more than he does. But it was all about to snatched away from Bryan, as WWE Championship Money in the Bank Winner Randy Orton made his way down to ringside. At first it would appear to be just a warning, but then the swerve came...when Triple H delivered a Pedigree to Bryan. Orton saw his opportunity slivered into the ring, handed WWE's COO the briefcase and pinned Daniel Bryan to become the new WWE Champion. If Daniel Bryan winning the title was perfect end for one story, this was the perfect start for another, with Triple H and Randy Orton both as heels again, definitely roles that both excel in, against the red hot Daniel Bryan. The best thing about this ending, watching the internet cry all over Twitter. I don't think there has been such a mass mark out on the internet ever, as people seemed genuinely upset that the face had lost the title, with an outpour of hate against the heels. They might have not liked Bryan losing the title, but there is no denying that seeing Bryan chase the title again before finally winning it back will be even sweeter. The build up for this one had been superb, with the story building well over the two months following CM Punk's victory over Chris Jericho at Payback. With Brock Lesnar only appearing a few occassions on Raw over the past two months, it gave Paul Heyman and Punk room to manourve their story into place, with such a rich history between the to to play with. Heyman's turn on Punk at Money in the Bank was perfectly time to give the story another boost heading into SummerSlam. We'd seen a number of confrontations between Punk and Lesnar over the past month, with Lesnar usually coming out on top, after a valiant attempt by the smaller Punk. Even with Punk eventually getting upperhand on the previous Raw, the real story was that Punk still didn't manage to get his hands on former best friend Heyman. As with a lot of CM Punk's longer matches, the opening was fairly basic, but it felt like the calm before the storm in this case, as you just knew something special was about to happen between two of WWE's biggest names. And it sure did, with Lesnar almost completely dominating Punk, and similarly to their confrontations on Raw, we'd see Punk attempt to fight back only for Lesnar to find another way to take down The Second City Saint. Punk took an absolute beating in this one, with Lesnar delivering a hell of a lot of punishment, including launching Punk over the announce table and breaking the top part of the announce table on Punk with a Double Foot Stomp. Then there was one of the best submission sequences in recent memory, with Lesnar reversing a GTS attempt from Punk into the Kimura Lock. Punk's selling and subsequent reversal into a Triangle Choke were perfect and the crowd absolutely loved this part of the match. It took two powerbombs from Lesnar to break Punk's grips with Punk fighting all the way. After several near falls, including a dangerous looking spot with Punk delivering a Diving Elbow Drop whilst clutching a steel chair, we headed towards the conclusion of the bout. With Punk reversing an F5 into a DDT, before locking in the Anaconda Vise, it looked like Punk might have Lesnar's number. However, with Heyman edging into the ring with a steel chair, Punk saw his oppurtunity, blocking Heyman and locking in the Anaconda Vise on him instead. It was another memorable moment during the bout, and seeing Punk get his revenge on his traitorous former manager certainly felt satisfying as a fan. However, the match wasn't over, and with Brock Lesnar delilvering a couple of vicious chair shots, followed by an F5 onto the steel chair, Lesnar picked up the pinfall victory. It was an enjoyable finish, that allowed Lesnar to look strong heading into a possible headline bout at WrestleMania, whilst also giving Punk the moral victory by allowing him to get his revenge on Heyman. So where does CM Punk go from here? We've seen him lose to two part timers in the space of six months, in the shape of The Undertaker and Brock Lesnar, so WWE is going to have to build up Punk once again. It doesn't feel like the story with Paul Heyman is quite done yet, but I'm not sure where WWE will take it from here. With the next Pay-per-view being Night of Champions, it would seem that the only place on the card for Punk would be an Intercontinental Championship Match with Curtis Axel, which would certainly be a step down for Punk. Unless, they run with a Punk vs. Heyman and Axel Handicap match, which has potential to work well. I wouldn't imagine that we'll see Brock Lesnar until just before WrestleMania, although it would be nice to see him make a surprise appearance at the Royal Rumble, which would allow Punk to get a little bit of revenge on the Beast Incarnate. In the other headline match of the show, Alberto Del Rio defended his World Heavyweight Championship against Christian. This match had been poorly built up by WWE over the last five weeks, with no real storyline behind it. It had felt like a huge after thought for WWE, who only really started the build for this one about two weeks ago, when Christian was named Number One Contender after defeating Rob Van Dam and Randy Orton in a Triple Threat Match. Del Rio has spent most of the time after Money in the Bank, looking incredibly weak with a number of high profile losses, including two to Christian, not really helping his World Heavyweight Championship reign feel particularly significant. “caution to wind“ feel to bout, keeping the whole thing feeling pacy and exciting throughout. Del Rio gets a lot of stick from certain areas of the internent, and I'm really not sure why. Personally, I think Del Rio is great in a heel role, admittedly his face run was poor, and rarely has a bad match in the ring on television or pay-per-view, and he works extremly well here, with some vicious attacks, whilst also appearing cowardly at times, it's easy to dislike Del Rio. A highlight of this bout for me was a nice sequence that saw Del Rio escape a Killswitch attempt for Christian sending him into the corner, with Christian attempting his familiar Sunset Flip routine, only to get caught with a Backstabber from Del Rio for a near fall. With the match continuing to build with several nearfalls, the ending sequence had to come up with something special to end the match satisfactorily. With Christian clearly favouring his arm, with some superb selling, made even better by Captain Charisma's strong facial expressions after every near fall, really telling the story of the bout, Christian hit a Spear out of nowhere. Just when it looked like Christian might be winning the World Heavyweight Championship for the third time, Christian's arm appeared injured once again from the Spear, giving Del Rio enough time to recover and lock in the Cross Armbreaker. Christian spent an age in the hold, even getting a roll up attempt for a near fall, but Del Rio held on and eventually got the submission victory. It was another strong finish on a show of strong finishes, with Christian looking extremely tough holding on for so long, and Del Rio's World Heavyweight Championship reign looking back on track with another strong pay-per-view contest. I said before the bout that Del Rio and Christian wouldn't be able to top their bout on Smackdown a few weeks ago, but they actually managed to blow it out of the water with this one. Both men deserve a hell of a lot of praise, and hopefully the match won't get over shadowed too much by the other two main events. I think that might be it for the Del Rio vs. Christian series, as WWE never really put enough effort in the rivalry to begin with, it would be nice to see Christian rewarded for his continuing good performances, but I can't see it happening anytime soon. Del Rio will move onto a new challenger for Night of Champions, with his post-match speech identify himself as a hero to all Latino indicating it could be a returning Rey Mysterio. Elsewhere on the show, Kane took on Bray Wyatt in a Ring of Fire match. 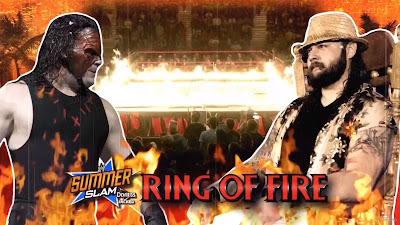 This was essentially an Inferno Match, last seen at Armageddon 2006, with the change being that the match must be ended by pinfall or submission rather than by setting your opponent on fire. Personally, I preferred these rules to the old ones, as it gave the match more of a definitive feel, whereas Inferno matches usually ended via somekind of fluke. That being said this was by far the most dispointing match on the card after some tremendous build up over the last six weeks. The action in the ring wasn't particularly gripping, even if the visual of the fire was impressive. With the rest of The Wyatt Family at ringside they made repeated attempts to get into the ring or pass Wyatt weapons, including putting out the flames with a fire extinguiser that one of the firemen had at ringside. However, their antics at times were a little slapstick and over the top, and didn't really suit that characters that had been shown on previous shows. The ending saw Kane absolutely destroying Wyatt with two huge chokeslams, only for the Luke Harper and Erick Rowan to manage to get into the ring using a fire blanket. Harper and Rowan quickly over powered Kane, allowing Wyatt to hit Sister Abigail for the pinfall victory. The ending made Wyatt seem incredibly weak without his family, but the group as a whole were put over well. Maybe that's how WWE wants to play it with these, but they'll have to be incredibly careful if they want Wyatt to eventually be a star in his own right. After the bout The Wyatt's repeated the spot from the debut, smashing the steel steps over the head of Kane, with Bray Wyatt looking on from his rocking chair. It was another impressive visual and it would appear that Kane is taking time of for now, I would expect him to come back to get at Bray sooner or later, with Hell in a Cell seeming like the perfect time for the two to collide once more. Another match which had been booked well heading in was Cody Rhodes facing off against World Heavyweight Championship Money in the Bank Winner Damien Sandow, focused around Sandow's betrayal of his former best friend to gain owenrship of the Money in the Bank briefcase at the previous pay-per-view. Sandow cut a strong promo before the bout, putting himself over as the leader of Team Rhodes Scholars, before insulting Cody's family, naming them carnival clowns. The bout was short, but sweet. Sandow dominated the early going, working over Cody well, including well-excuted version of a Texas Cloverleaf. With Cody making his comeback, through the form of a beautiful springboard missile dropkick the match really got going, with Rhodes' facial expressions selling his hatred for Sandow and getting the crowd involved in the match. The ending saw Cody attempt a roll up, only for Sandow to hold onto the top rope, but Cody had the move scouted, jumping straight back to his feet and hitting Cross Rhodes for the pinfall victory. It would have been nice to see Rhodes and Sandow have a bit more time to show us what they can do, but with so many other big matches on the card it's difficult to see where the time would be found. Hopefully we haven't seen the end of this rivalry as it's really brought some life to Raw and Smackdown over the previous month or so, in areas of the programme that would usually be the toilet the break. Hopefully we'll see them get a good twelve minutes plus, on a future pay-per-view, and hopefully both will be moving up the card after their feud is over. There was also Mixed Tag Team action with Dolph Ziggler teaming up with Kaitlyn to take on Big E Langston and Divas Champion AJ Lee. This match suffered from being sandwiched between Punk vs. Lesnar and Bryan vs. Cena, with the crowd clearly worn out from one match and looking forward to another. The match itself however was actually a solid mixed tag team action, with a nice dynamic between the four competitors. Ziggler and Langston finally seem to have found some chemistry in the ring and their action worked the big man vs. small man angle well, whilst AJ Lee and Kaitlyn had another strong piece action. The ending saw Ziggler move out of the way of charging Langston sending the big man into the ringpost, with Ziggler building for a Zig Zag, AJ Lee caused a distraction, only to end up on the receiving end of a Spear from Kaitlyn. Langston attempted to take advantage of the distraction going for the Big Ending, but Ziggler slipped free and hit a Zig Zag for the pinfall victory for his team. It was a strong ending sequence that built up well, it would seem like Dolph will be moving into a different story after this, with AJ getting a new challenger for her Divas Championship, so this was a nice end to their story. There was more women's action on the card, with Natalya, acompanied by The Funkadactyls, taking on Brie Bella, who was joined by twin Nikki Bella and Eva Marie. The actually match here was pretty good. Brie Bella works fairly well as a heel, especially against the likeable Natalya, mainly because Brie is seen as someone who has gotten too many chances, whilst Natalya has been passed on by WWE. The outside interference was frustrating at times, as it detracted from the fact that the wrestling was solid, and reminded everyone we were watching a match essentially there to promote Total Divas. The ending saw Natalya reverse a running attack from Brie into an Alabama Slam, before locking in the Sharpshooter to get the submission victory. Hopefully, Natalya will continue to be pushed by WWE, a title match against AJ Lee at Night of Champions would do wonders for WWE's Women's division. The Miz was our official host for SummerSlam and I have absolutely no idea why. His hosting duties essentially meant he was the back stage interviewer, as he spoke to Maria Menounous backstage. Miz was interupted everytime he appeared by Fandango and Summer Rae who would begin dancing in front of The Miz, including a bizarre opening segment that left me simply confused. Eventually, The Miz had had enough of Fandango and hit him in the face, the only problem is, I think I would've rather seen Fandango lay out The Miz instead. We were also treated to a random backstage segment featuring Ryback dumping gaspacho down a caterers underwear and covering him in what looked like curry. It's strange how far Ryback has fallen in the last couple of months, especially after Chris Jericho put him over at Money in the Bank, you would have thought that it meant WWE had an immediate plan for Ryback at SummerSlam. However, I do think this change in character will do wonders for Ryback, as he actually has a definable character that he didn't have previously. I'm willing to see where WWE is going with this character, even if it is essentially Bully Ray with muscles. What did I learn from this year's SummerSlam? 1. Randy Orton might be WWE Champion, but Daniel Bryan going over John Cena clean is a certain sign in WWE's faith in the wrestler's popularity. 2. 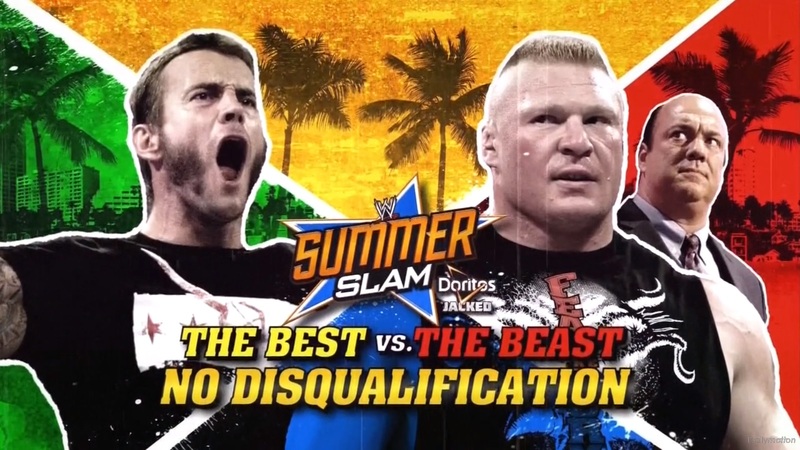 CM Punk vs. Brock Lesnar has to go down as one of the best all-round stories of all time. From start to finish it was pretty much perfect. 3. Christian vs. Alberto Del Rio is going to be one of those underrated classic matches.